Oh how I love Hope King and Kim Bearden... well, all the wonderful employees at Ron Clark Academy actually! I especially love their classroom transformations and how exciting it must be for those students to experience school with such magic around them. Their classrooms are truly beautiful and a dream to create! How beautiful, right?! Hope recently did a Toy Story theme that is out of this world! You can see the details on her Instagram and it will make your jaw drop! Both Kim and Hope are known for their classroom transformations and seeing all of their photos truly makes you have teacher envy. This past year, I dug into classroom transformations a bit in my own room. I plan to implement as many as I can this coming year as well because I truly love doing them, not because it's all the rage these days. 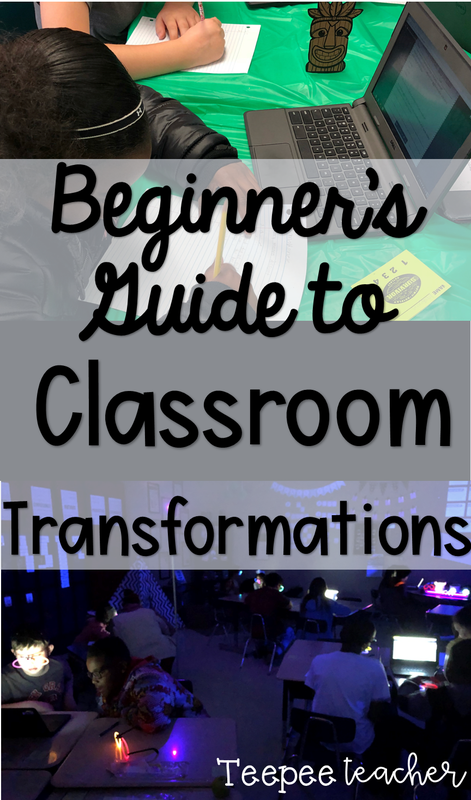 Classroom transformations isn't for everyone and you shouldn't feel pressured to do it just because the teachers you follow on social media are doing it. For me, it's the perfect combination of the 2 careers that I wish I could have: teaching and party planning. I LOVE to plan people's parties and thrive on themes. So when I decided to do classroom transformations, it brought both of those 2 together for me. I see many people saying classroom transformations aren't their thing but want to try one to just see. Yes!! That is awesome and brave and bold and incredibly terrifying and overwhelming, but YES!! My weakness is songs in my classroom, it is not my thing to create a song and teach it to my students. I love music but I hate performing. I tried it once using main idea and Drake's "Started From the Bottom" and it was exactly how I described a classroom transformation: it was awesome, brave, bold, incredibly terrify, and overwhelming but I tried it! 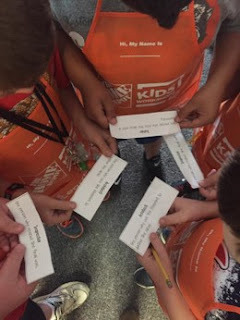 My kids loved it and it had every student engaged. But, I stick to what I'm comfortable with doing while finding new ways to engage my students so classroom transformations it is! Think about a lesson that you know your kids need to become proficient in, a standard that is ultra important. What are some activities you already have planned for that standard that you can easily change to be centered around a theme? Figure out your theme from there. This sparked my idea to do a construction theme because it looked like building a house. 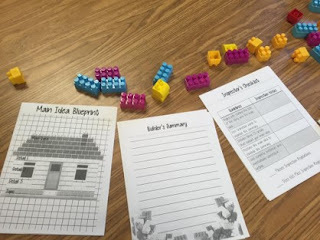 So I created a whole day centered around activities that went with constructing summaries and finding the main idea. You can find the materials for this theme here. I immediately go to Pinterest for ideas on my newfound theme. People put on parties for everything! I use this as a guide to get my ideas going of what all do I want to really do. What are some color options, some DIY projects, or what can I get at the dollar store or Amazon pretty cheap? What is an outfit idea, because really if you just dress up, your kids are already interested to know what's happening that day! Putting on a classroom transformation can't be done overnight, but it also doesn't have to be something that takes months in advance of preparation, time consuming, or expensive for your kids to be excited and engaged. When you look at Hope and Kim's transformations, it's all heart eyes but also overwhelming to think you can create something that perfect especially your first time. (If you can, go for it! But I cannot.) The number one thing I tell people to do when they want to do a transformation is get some table clothes from the dollar store and it will change everything. This is another transformation I did for my kids to present their book reports. They did a Book Buffet (bought on TpT) and the day they brought them in, I had picnic table clothes and played cafe music. It was amazing! Simple, easy, and full of engagement! The biggest issue my husband has with my classroom transformations is how expensive it can get. If you use your resources wisely, it can really save you! I use the same table cloths for multiple themes. I borrow resources from other teachers or friends by posting it on social media. I have ideas for themes that I keep in my mind for when I go to the dollar store or Target/Walmart and find things on sale. I also ask for donations from stores and it's amazing what they'll give to teachers! For my construction theme, I contacted Home Depot and they donated nearly everything! I got aprons for my students and caution tape for free. For my neon theme, other teachers in my building had black lights already that I was able to borrow. I also bought some light bulbs from Walmart after Halloween that were super cheap! I brought in some lamps and it was done! I also save things I've made or bought and use them each year and add a little more each year to grow my theme. If you're not one to continue doing this or hated the theme, see what you can return back to the store after using (like black lights from Walmart). Don't judge y'all, we're on a teacher salary here! Hope will tell you she does the same thing. It takes A LOT of time to put up a classroom transformation so use it for more than just one day. I usually have mine up for 3-5 days. I will stay late after school setting everything up and then it's ready for the whole week of activities. On the first day, I always plan the hardest content because the kids are super pumped and fully engaged. This is usually the first day introducing a new topic. Throughout the week, the theme looses its excitement so I try to put in some twists to the activities or add games, but they at least have a strong foundation of the content being presented from day 1. Finally, just own it! The only reason for doing these transformations is to have your students more engaged in what you are teaching them that day, not how Instagram-worthy it is. Remember this, my friend. Go big, go small, dress up, create a backdrop, lay down a table cloth, hang things from the ceiling, put on some theme music, whatever it is, make it centered around rigorous content, engagement, and have fun while doing it! Some people who I love to follow their classroom transformations, besides Hope and Kim, are Simply Engagement, Brooklyn's Brightest, and True Tales of a Teacher. They are all inspirational with their ideas and are always trying something new. Check them out for some theme ideas! This is such a perfect post!!!!! It’s so easy for transformations to feel overwhelming but you give a great concise guide to make it feel attainable!